Inman is profiling independent brokers for a new series. Here’s Pat O’Brien of Pat O’Brien & Associates. My reason for staying independent is the ability to make changes as needed, such as website updates and print advertising, without getting approval somewhere up the line. It allows me to have money to pass along to commission splits that would be harder to do with franchise fees. It seems to create a better working atmosphere within the office. I decided to do this 10 years ago when the office I was with became convinced that I need them more than they needed me. At the time, I was doing 50 percent of the entire office business alone. They became very inflexible in their thinking and actions. They wanted to charge me a 5 percent delinquent charge when the office bill came due because I was on vacation when it arrived, and we had five days to pay it … I paid every bill I received the day I got it, and always had. It felt like the time to be independent. I had built a reputation in the real estate business that people could count on — they trust me. People asked me all the time, “Why don’t you go out on your own?”… I finally did. It turned 10 years old on May 2, and I have been in the business 25 years. I guess the biggest challenge was hand-selecting the people I wanted to work with. I have 12 people in my office: eight full-time agents, a rental manager, an office manager and two assistants. When I opened the doors, it was just me and one other agent. The easiest part was getting my existing listings to come with me. Myself and one other agent work with full-time assistants — a 4-to-1 ratio seems right. I am not. I have found that the three highest-volume offices in Charlevoix and Emmet counties are independents. That we look out for each other and the willingness to help each other without looking for compensation … we just do it. Rare in most offices. We are located in Boyne City, Michigan. Our office is on the busiest corner in town, with frontage on two streets — lots of glass for displaying photos. We try to have a “living room” feel to our office — it’s relaxing, attractive — a fun place to come in and sit down. We are in a space that used to be a bank. As soon as I walked in, it fell into place in my mind. Then, two years ago, I took another 12 feet by 80 feet out of the space next door; it was the second-smartest thing I did. Eight offices and eight agents. By leading by example. I am in the fortunate position of having agents who would like to be here … I am just out of room. My adverting budget far exceeds most franchise offices if you measured it office to office — we have a great website, advertise regularly in several high-end magazines, have a billboard, write letters consistently, and maybe most importantly, we are involved in a lot of community efforts. My birthday is St. Patrick’s Day … it is one heck of a bash, along with our annual Christmas party — also a great party. We also have a couple of brainstorming events — we try to do something fun as an office and then have lunch and brainstorm. We have an annual office Christmas party that is a lot of fun, and gives us a chance to enjoy each other’s families, and we attend Michigan’s annual Realtor conference as an entire office, making sure we have at least one meal all together. It’s a lot of fun, and great for morale. Yes, we have an incredible website, we use a number of high-end publications for our waterfront. And our catalog is second-to-none as far as quality and content (another reason that being independent is a nice way to be — we can create our own timelines and lay out our catalog ourselves). Our publishing platform is WordPress — our office manager and my assistant both use WordPress. We are also working on getting our agents pages within the office website where they will have individual pages they can update and blog through if they wish. At the end of the day, it gives us a tremendous amount of latitude that we wouldn’t have with a franchise. We make our own rules! And there are no challenges; once in a while, a seller wants to know why they should list with us as opposed to a franchise — I just pull out the sales records. All full-time agents, our community involvement — including giving close to $55,000 to different Charlevoix County charities through a 1 percent donation of every closing. We have done this over a five-year period. We have a bond within the office that other offices can’t touch. The building addition we did that allowed us to grow in numbers. 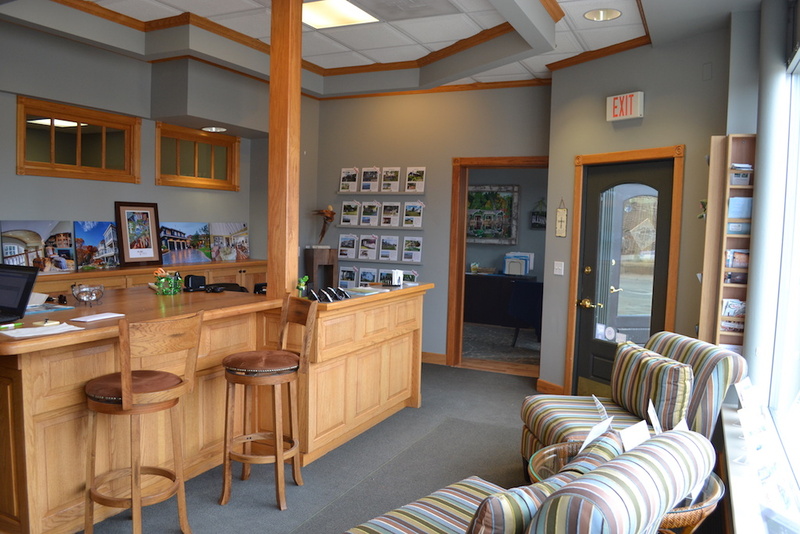 In 2015, we opened a branch office in downtown Charlevoix. Small but very convenient.